This miniature multiloop synthesizer achieves wideband frequency coverage and reference-like phase noise without sacrificing fast settling time. Frequency-synthesizer performance is usually a compromise. Single-loop phase-locked-loop (PLL) designs can achieve fast switching speeds, but lack the filtering capability to dramatically lower phase noise and spurious content. Multiloop synthesizers can cut the noise, although the multiple loops require longer frequency settling times. Significantly, the engineers at Synergy Microwave (Paterson, NJ) have blended multiple frequency-synthesizer technologies, including PLL and direct-digital synthesizer (DDS) techniques, in their new model MTS2000-DS multiloop frequency synthesizer. The result is a miniature coaxial source capable of octave-band (1 to 2 GHz) tuning with fast settling time, low phase noise, negligible spurious content, and impressive 1-Hz frequency resolution. The MTS2000-DS employs mix-and-divide frequency generation, using PLL filtering to reduce spurious content. The synthesizer offers the phase-noise performance of a traditional fractional-N synthesizer, but with considerably wider bandwidth. In spite of its combination of technologies, the sophisticated model MTS2000-DS measures only 4 X 4x1 in. 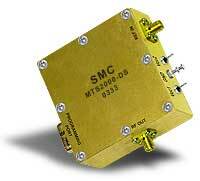 (10.16 X 10.16 X 2.54 cm) with SMA female RF output and reference input ports. The low-mass 50-Q synthesizer is extremely rugged and maintains high stability even in high vibration environments. With its complete DDS circuitry, the MTS2000-DS can tune from 1 to 2 GHz in frequency steps as small as 1 Hz (other step sizes can be readily programmed), but still settle to a new frequency in less than 2 ms, making this an ideal "building-block" source for built-in-test-equipment (BITE) systems and dedicated test instruments. 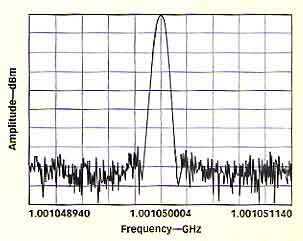 phase noise of -94.97 dBc/Hz offset 1 kHz from the carrier. The MTS2000-DS frequency synthesizer delivers nominal output power of +3 dBm. It maintains relatively flat output power of ±3 dB over a wide temperature range of -20 to +70ºC. The spurious content is suprisingly low for a DDS-based source (thanks to the multi-loop configuration), at an almost negligible -65 dBc. quency signals. The phase noise for the MTS2000-DS is based on a stable reference source with phase noise of-140 dBc/Hz. Near the noise floor (an offset of I MHz from a 1-GHz carrier), the phase noise approaches that reference level, at -135 dBc/Hz. Closer to the carrier, the specified phase noise is-90 dBc/Hz offset 100 Hz from a 1-GHz carrier, -95 dBc/Hz offset 1 kHz from a 1-GHz carrier, -95 dBc/Hz offset 10 kHz from a 1-GHz carrier, and 110dBc/Hz offset 100kHz from a 1-GHz carrier. Hz (see figure). Additional measurements on the spectrum analyzer revealed phase noise of-95.41 dBc/Hz offset 10 kHz from the carrier, and-108.51 dBc/Hz offset 100 kHz from the carrier. reference frequencies, contact the factory. Although the initial design covers1 to 2 GHz, the architecture is fullable scalable to cover other frequency ranges. The MTS2000-DS employs a D-type connector at its data port, and a simple three-wire programming interface. The frequency synthesizer operates with bias supplies of typically 350 mA at +5 VDC and typically 50mA at+20 VDC. P&A: $1795.00 (small qty. ); stock.